After a rather underwhelming bread experience in an - otherwise nice - hotel last year, I challenged my co-bloggers, facebook friends and hobby bakers from The Fresh Loaf to help fill a basket with "Bread for Götz von Berlichingen", to provide Schlosshotel Götzenburg with a better breakfast choice. I was so happy with the interesting contributions that I promised myself to bake as many of the 30 breads as possible, and, also, to showcase some of them on my blog - like Khalid's Götzenburg Bread from Dubai, und Britta's Double Potato Loaf for Götz from the Lower Rhine. Just in time for Zorra's World Bread Day 2015 I was happy to present Fresh Loaf blogger Dabrownman and his Swabian Potato Bread for Götz of the Iron Fist. My version of DBM's hearty Potato Bread for Götz of the Iron Fist - my new favorite! 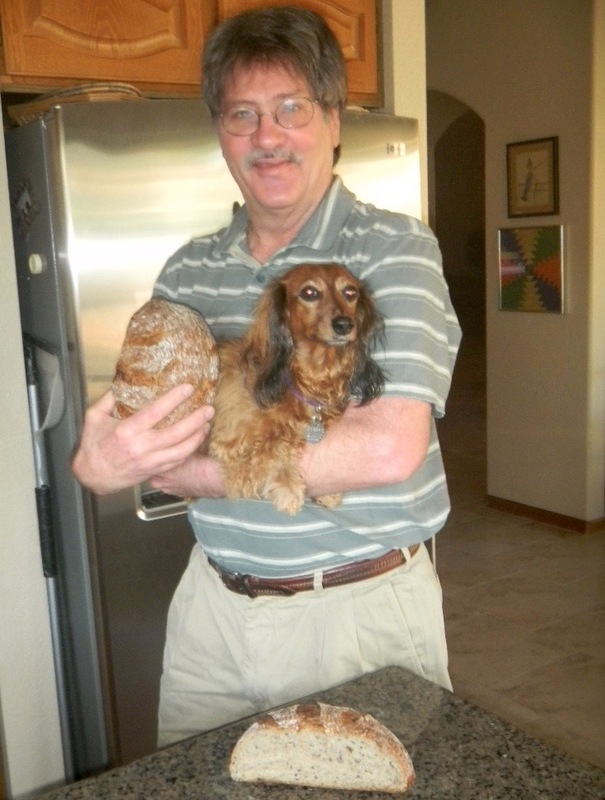 Dabrownman - "everybody calls me Brownman" (or DBM for short) - resides with his wife, college age daughter, and dachshund Lucy in Arizona. An architect by schooling, he designed and supervised worldwide the construction, and ran the operation of distribution centers for the food industry. "Food and Facilities is what I did the last 23 years". A spectacular bake and a warm introduction to our infamous friend, Dabrownman. We know it's really him, because we know Lucy, Apprentice, 2nd Class, alter-ego and partner-in-crime. 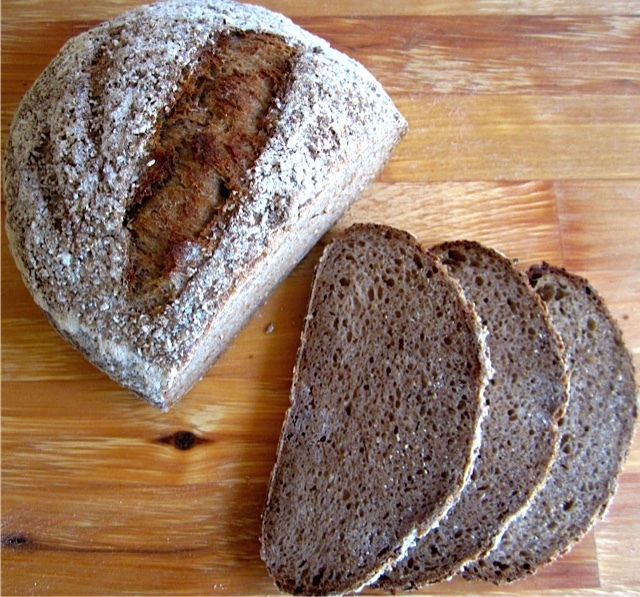 Swabian Potato Bread for Götz of the Iron Fist looks to be everything it promises. Thanks for sharing it! It was fun to write this up, and the bread was really worth it. last is you new favorite:-) This is one of our favorites too. Lucy says that other insane madmen, like Stalin, have long known that 'quantity has a quality all is own' and sort of explains her bread baking ans posting proclivity. She also says that when you are as bad at it as I am you need all the practice you can get. I'm not saying that Lucy is like Stalin but they both have or had a thing for Pumpernickel! I think your goal of baking ll the Goltz of the Iron Fist breads submitted is a fine self challenge. I was wondering if Schlosshotel Götzenburg ever got back to you on the original challenge?. Glad you liked Einstein's Swabian Potato Bread . Without it we would not know that all things are relative. Lucy appears to be your sternest critic - I remember her snide remark about you and the bikers' pub! But she does seem to spur you on to achieve crust and crumb greatness. Sadly, the Schlosshotel Götzenburg never got back to me on this - unlike the Schlosshotel Cecilienhof (of course, they could have only be very pleased, since their Cecilienhof Vollkornbrot was worth the challenge to copy it). I wrote on the contact page on their website, and posted a link and comment on their facebook page. Though they seemed to like the idea, when I told them about it when we checked out, there was no reaction. Either they were miffed about their bread being criticized, or they are not very social media savvy. FInally, I've seen the man behind those great breads and tricks! Thank you! Now he can't hide behind Lucy anymore! but my first thought looking at the photo was, "doxie sandwich?" Nice post….thank you Karin!